My buddy and I are planning another 30+ mile backpack at BBRSP, and are hoping to include the Solatario in our route. So, we're wondering if anyone has any experience with the Los Portales and Lower Shutup routes and can give us an idea how tough/easy they might be. We've done the Rancherias Loop multiple times, and last February packed from West Contrabando to Rancherias East via Madrid Falls, so we have some experience with the terrain. TomJ, I love these kinds of ambitious hikes in BBRSP and right now is exactly the right time to do it. However, the Solitario presents some unique challenges that will require some extra consideration. First of all, while the geology of the Solitario makes this feature an excellent water trap, there is no water readily available within the Solitario itself except at the Shutups and Tres Papalotes. Further, the only dependable water is within the Lower Shutup, though it should be noted that it occurs in a massive tinaja (roughly 1.75 miles south of the LSU trailhead) that actually impeded movement through the canyon and forcing one up a very steep route and up through a narrow saddle roughly 200 feet about the canyon floor and back down. It is a sketchy move with a daypack much less a heavy pack. The Righthand Shutup is also quite challenging, as is the Outer Solitario Loop that is used to access it. The Portales Trail is probably one of the more ridiculous routes in the park and will make the Rancherias West descent seems like level ground. Needless to say, I couldn't possibly recommend it to through hikers. To conclude, through-hiking the Solitario is a very difficult prospect at best and will test not only your stamina but your route finding skills as well. You will almost have to plan on caching water to complete this leg. If you are interested in an alternate leg to your adventure, let me know and I will help in every way possible. Start at RHS TH and go up RHS; circle south on trail to Los Portales and back down it to the jeep trail; then back up north to car? Also, what would you say is the best way to explore LSU--just start at the LSU TH and go down LSU and reverse to get out? Or is there a loop that can be formed? Lastly, on GoogleEarth Fresno Peak seems feasible from LSU TH; any overwhelming challenges there? Can't speak to either LP or LSU, but the RSU is actually pretty easy...wouldn't faze you a bit. No water there, though. We attempted to traverse the righthand shutup in the Solitario -- outside in -- and were blocked by a wall of boulders within maybe a 100 yards of the exit. Hike was about 2 miles one-way and gained perhaps 600 ft -- lots of scrambling up some pretty steep rocks. To conclude, through-hiking the Solitario is a very difficult prospect at best and will test not only your stamina but your route finding skills as well. You will almost have to plan on caching water to complete this leg. Ranger Tim, thanks for the advice. I reckon I need to find an easier route. Maybe we'll try Puerto Chilicote to East Contrabando. Hopefully there'll be water in Fresno Creek. What are the chances of being able to get water at Contrabando Waterhole in mid-January? Tim, can you clarify whether the RHSU is passable, given the old thread-quote below? We attempted to traverse the righthand shutup in the Solitario -- outside in -- and were blocked by a wall of boulders within maybe a 100 yards of the exit. We stopped to turn around & head back out to Fresno Creek at the "X"...maybe you can't go any further east from there? Thanks for the link. We had pretty much the same experience walking up Fresno Creek from West Contrabando TH in Feb 14 - there was plenty of water in the creek at the spots where rock layers force the water out. Ditto the arroyo running past the Madrid house. I'm sorry, but I cannot really speak to the accessibility through the RHSU as I have never through hiked it. With that said, the scarcity of water in the Solitario would preclude me ever suggesting such an adventure to all but the most diehard and masochistic (re trtlrock). Prehistorically, the area was very lightly used and nominally only for resource procurement, which I think speaks volumes regarding its potential as a travel route. Your notion of a Puerte Chilicothe to East (or West for that matter) Contrabando sounds promising provided you can arrange a shuttle. Otherwise I would suggest a loop beginning and ending at the Chilicothe TH and touring the uplands around Chorro Vista, down to Madrid House, around to Crawford Smith, and back up to Chilicothe via the trail from Fresno Campsite to Fresno Vista Overlook. The latter part of this hike is very difficult owing to the poor trail quality (complex geology) but it is a tenable hike that I hope we can improve over time. Otherwise, Chilicothe via Chorro Vista, Madrid house, Fresno Cascade, and down to the Contrabando should be a nice two to three day hike. Also, there is currently water in the Waterhole. There is also water below the Wax Camp on the East Main Contrabando Trail, as well as numerous pools between the Wax Factory and the Narrows in Fresno Canyon. Overall, the water situation is good right now. Of course, I have to couch this with the proviso that one should filter all water taking from pools, springs, and seeps in BBRSP. Thanks for the tip on water! We drove into the Solatario back when the Park first opened, and I've always wanted to go back and take a slower-paced look at it. So, as an alternate to the Lower Shutup route, how about that "road trace" that enters the Solitario from south of Eagle Mountain? Any problem hiking thru the two small private inholdings? I am not familiar with the road trace that runs East from below Eagle Mountain, but I would imagine that it could be pretty difficult to locate. As far as the inholdings go, they are private property and as such I cannot advise try to access them without expressed permission from the land owner. One option for hiking the Solitario would be to hike the inner loop that runs from the Burnt Camp trailhead to the head of the Lower Shutup and back. At 9.6 miles, it is a bit long for a day hike given the short days, but it would fulfill your Solitario itch. The only thing that I have head about this trail recently is that the road between Mc Guirk's Tank and Burnt Camp is not currently passable, but other it is a fine hike. As far as the inholdings go, they are private property and as such I cannot advise try to access them without expressed permission from the land owner. 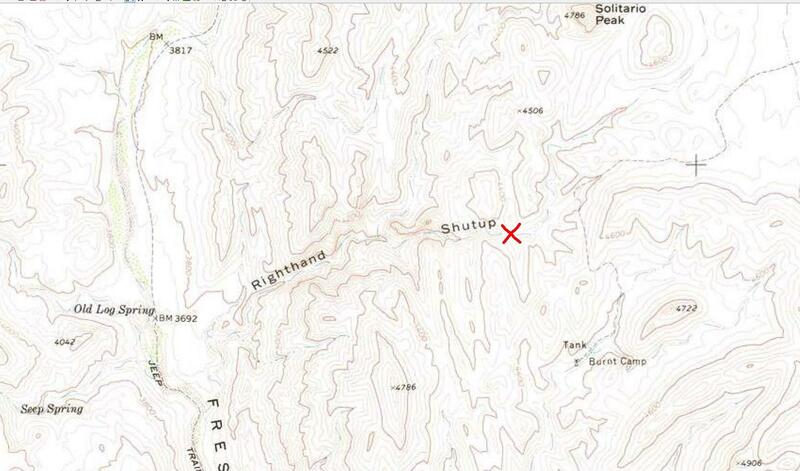 One option for hiking the Solitario would be to hike the inner loop that runs from the Burnt Camp trailhead to the head of the Lower Shutup and back.